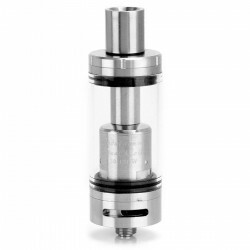 Today we get the original Indulgence Mutank Sub Ohm Tank, which is 304 stainless steel and Pyrex glass construction. After opening the box, we can see a tank, a replacement 0.3 ohm dual-coil head, a quad-pole RBA base, a replacement glass tank and the accessories pack. It is a prefect coil replaceable and coil rebuildable tank, with top filling system and bottom airflow control. The diameter of this tank is 22mm and height is 68.3mm, lightweight only 56.8g. The large Pyrex glass tank holds 5mL e-juice. It is pre-installed 0.3 ohm dual-coil head which can power 30W to 150W to provide you the best and flavor experience. The unique build deck and generous juice channel give you the unlimited possibilities to build your own coils. It is airflow adjustable control from the bottom, dual 11mm by 2mm air slots on the bottom with AFC ring, and dual 5.3mm by 3.2mm internal airflow on the coil, giving the Mutank the top level capability. The tank is with popular top filling system. There are 2 concave big filling holes on the topside, easy and fast to refill. 1) Press the top cap and remove is anticlockwise. 2) Add the liquid through the filling holes slowly and pay attention not to dripping it into the center airflow tube. Please close the bottom airflow slots as filling. It is pity that the tank kit does not comes with the twisted coil, Clapton coil, quad coil or the velocity style dual-pole coil. The good news is that you can pre-order is from 3Fvape. The Mutank provides many innovative replacement coils. There comes with dual-coil head and quad-pole RBA deck. The accessories pack includes vape band, sealing O-rings, screws and screwdriver. The Mutank comes with standard 510 drip tip. The unique drip tip has two different ways to keep it cool, one is the thin delrin layer at the bottom, it keeps the temperature from the stainless tube, secondly, the vacuum insulation always keep the stainless tube from being hot. I’ve read several reviews about this tank and I would like to add to that. So many people complained about how it performs with the prebuilt coils, ITS NOT OPTIMIZED FOR PREBUILT COILS!!!! That’s kind of a novelty so you can learn building at you own pace. I have not used any pre built coils on mine, only the velocity dual post head and at .25 ohm on my MadVapes Deviate (only goes to 60 watts so I keep it there) it is very good. I would give it 6-7/10 but I wouldn’t recommend it for any novice builders, it can be difficult to wick properly. Your either gonna have muted flavor or some leaking unless you have ideal cotton and a perfect build. If you don’t build it 100% perfectly you won’t be happy. It’s kind of ideal for decent builders to dial in there build capabilities. Since learning from this tank my goon and pulse rdas on my pulse squonker are so much better.